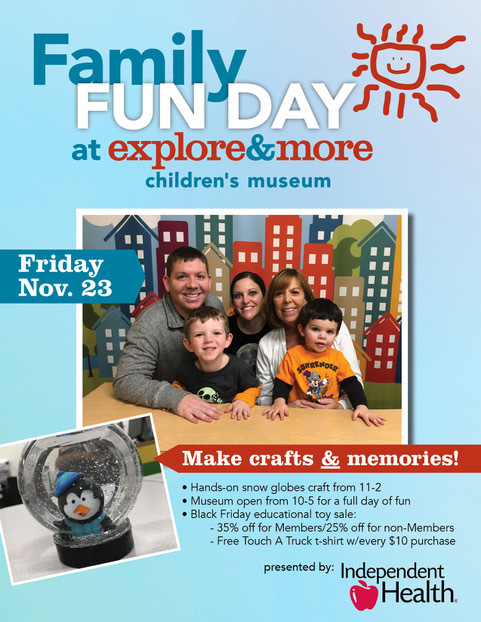 Explore & More Children's Museum Family Fun Friday! The holidays are a time to spend with family and loved ones, and there’s no better way to continue those Thanksgiving celebrations than by spending the day together at Explore & More! Gather the whole family for a special day of learning, playing and fun-filled activities at the Museum with Family Fun Day brought to us by Independent Health. This Black Friday have the children come make a holiday gift, free with admission or membership. On Friday, November 23rd from 11am – 2pm, children of all ages and their caregivers are invited to join us for a hands-on art project of designing snow globes to celebrate the holiday season! This activity is designed to extend the experiential learning of our Museum exhibits into a take-home art project that you and your family can continue to enjoy. With our hands-on snow globe activity, children will develop and improve their fine motor skills as they engage in manipulative, exploratory play – all while utilizing their scientific thinking in terms of measurements and number operations. And, each child will leave with a distinct work of art that expresses their personal interest, which only reinforces their sense of personality and wonder. Theater of Youth will be joining us with a fun activity related to their upcoming performance of Charlie Brown Christmas! While our special activity only lasts through the early afternoon, the Museum will be open from 10am-5pm for a full day of fun! Don’t forget to stop by the front desk and renew your membership or purchase a gift membership for a loved one for only $40 valid in East Aurora through March 30, 2019. Additionally, members receive 15% off in our gift shop on November 23rd only. Check out our great selection of educational toys that will keep your little ones busy playing and learning without even noticing!